You've most likely heard about the devastating floods in Australia. Lives have been lost and many families have lost all of their belongings. If you knit or crochet, you've most likely also heard of Sarah London, an Australian native. She's pretty much my crochet hero, a master of color, and the reason I wanted to learn how to make granny squares. Sarah has started a project called Crochet a Rainbow for flood victims in her homeland, and you can help, too. Sign up and read about the project here if you're interested in helping out. 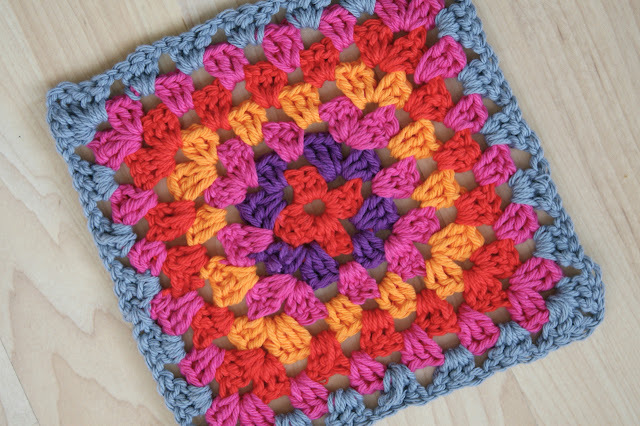 Sarah's looking for regular sized granny squares, five rounds each, which she'll join to make blankets that will be distributed to those affected throughout Queensland and Victoria as they begin to rebuild their lives and start over. If you're in need of some color inspiration, check out Sarah's crochet photo sets on Flickr to see her exceptionally cool color combos. You'll be itching to start hooking ASAP. This is a great crochet for charity cause. Glad to see others spreading the word! Came over here from Freckled Nest. Really enjoyed your blog. That's fantastic! I wish I knew how to crochet. So Cute! One day I will learn how to crochet too.